High Court of Uttarakhand is going to recruit fresher candidates in India for Additional Districts & Sessions Judge Posts. So, those candidates who are willing to work with this organization they May apply for this post. Last Date of Apply 09-May-2017. Total numbers of vacancies are 07 Posts. Only those candidates are eligible who have passed Advocate of not less than seven years standing as on the first day of January 2017. 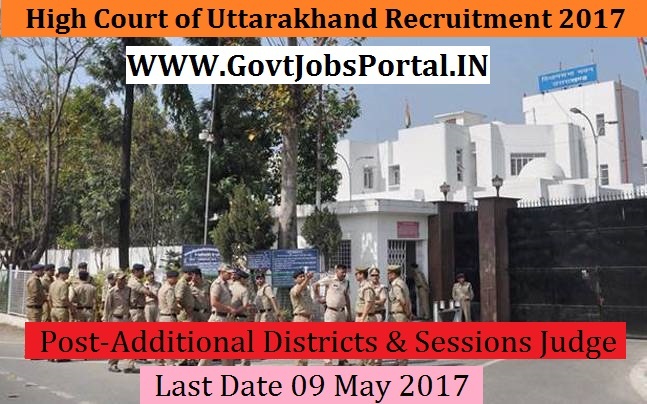 Indian citizen having age in between 35 to 45 years can apply for this High Court of Uttarakhand Recruitment 2017. Educational Criteria: Only those candidates are eligible who have passed Advocate of not less than seven years standing as on the first day of January 2017. Age Criteria: Candidates age limit should to be possess minimum age 35 years & maximum age 45 years.